Flu vaccine walk-in clinics will begin in October. They will continue on Thursday's through the end of 2017 as long as the vaccine is available. Clients may walk in between the hours of 9:00-11:00 am and 2:00-4:00 pm. Blue Cross Blue Shield PPO, Blue Value, Medicaid, Medicare advantage plans for AETNA/BCBS PPO, Medicare, Aetna, Coventry, Tri-Care Standard and Humana will be filed. Adults with other or no insurances will be charged $25.00. High dose flu vaccine for seniors (65 or older) is available for $45.00. Intradermal flu vaccine with the "tiny needle" is also available for adults age 18 to 64 for $25.00. Children with other insurances will be charged $25.00. Most children with no insurance will qualify for vaccine at no charge. CDC recommends that you stay home for at least 24 hours after your fever is gone except to get medical care or other necessities. Your fever should be gone without the use of a fever-reducing medicine, such as acetaminophen. You should stay home from work, school, travel, shopping, social events, and public gatherings. If you get very sick, are pregnant, or are 65 years or older, or are otherwise at high risk of flu-related complications, call your doctor. 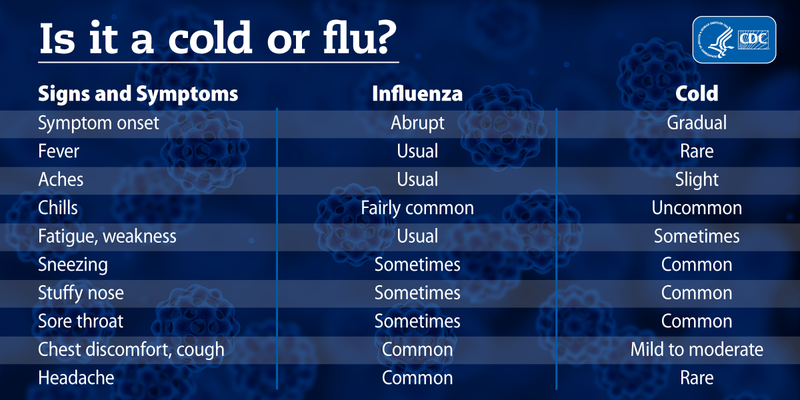 You might need antiviral drugs to treat flu. If vomiting occurs, increase fluids as tolerated. Start with clear liquids 1 ounce every 10-15 minutes and increase as tolerated. For fever and or body aches, administer Acetaminophen or Ibuprofen as indicated on package instructions or call office for additional guidance with dosing. Do not give children Aspirin unless directed by your doctor. Gargle with warm salt water for sore throat. Wash your hands often and right way after possible contamination. Links marked with an asterisk (*) are in Adobe Acrobat format (PDF).